A bathroom is such a safe spot in the house. It is a room where your guests can powder their noses or get themselves together. It needs to be calm and clear of clutter. The mirror must be cleaned to ensure there is always a clean and clear reflection in the mirror. The vanity is the most important part as it is the first thing they will notice. Pair a good vanity with a sink that was made for the gods and you have yourself a magazine worthy bathroom. Unless you plan to put the bathtub right in the center of the bathroom you will need to purchase a bathroom vanity top in Fairfax. This may seem hard seeing as not many companies will leave you with many options when it comes to style and color options. Luckily USA marble and granite have opened shop in the town. Fairfax now has access to their large collection of colors and style that will make you slightly confused. 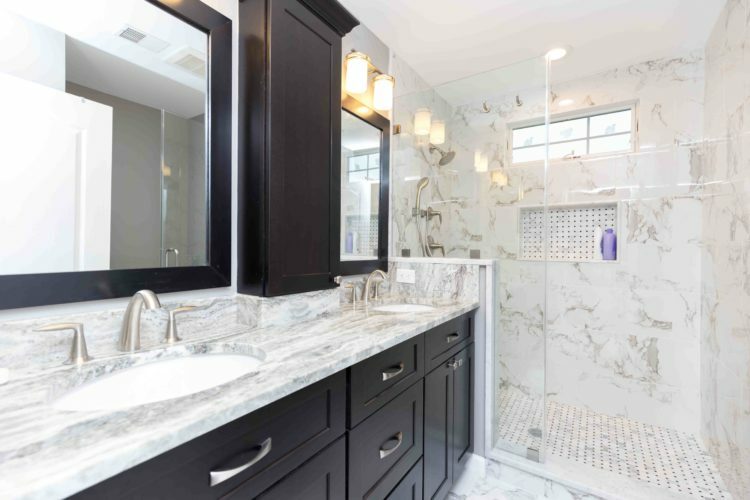 First let us take a look at the different options you have when it comes to bathroom vanity tops and the advantages of having a stone vanity top. When you decide to purchase a bathroom vanity in Fairfax then the first thing on your mind should be how it will clean. You do not want to be scrubbing the vanity the entire night after spilling something on it. This is why some stone options may be the best for especially if you’re always mixing concoctions in there. A bowl with warm water and mild detergent is enough to clean away the mess you will create on the vanity. When you decide to have a stone vanity in your bathroom then you will be spoilt for choice when it comes to the color options. If you feel like splurging then nothing can truly compare to marble. The stone is made so beautifully by Mother Nature that there is no way it could be any better. It is no surprise therefore that humans have tried to mimic the pattern using quartz. This is the cheaper version of the stone that has excellent color options since it is enforced using polymer. The ever subtly amazing granite is also full of unique colors. You do not have to get the same old vanity design installed. With the advancement in Quartz and other stone technology then fabrication is way easier. This means that the stone can be cut into so many different designs to fit your chosen vanity. You can even have the stone cut to fit one of your custom sinks. You can also have some stones such as quartz infused with flecks of broken glass and sealed creating a reflecting effect on the vanity. There are few cons when it comes to bathroom vanity tops in Fairfax. The stone can be extremely heavy and difficult to install by yourself. This is why you need the company technicians to do it for you. This fee will be less if you have purchased the stone form the same company.